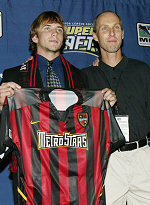 The MetroStars came into the draft with only one pick in the top 29, but came out with two #1s and two #2s after a day of wheeling and dealing by Bob Bradley. With the 2nd overall pick, Bradley drafted Furman midfielder Ricardo Clark, called by many the best overall player in the draft. Then he traded last year's 3rd overall pick, Brad Davis, to Dallas for the 4th overall pick, used on US Under-20 forward Mike Magee. Magee, who frequently trained with Bradley's Fire, is the leading scorer for US U-20s in 2002 at the age of 18. Then Bradley dealt next year's #1 to Los Angeles for the 12th overall pick, grabbing 16-year old New Jersey resident Eddie Gaven, the youngest player ever to sign with MLS. The 17th overall pick was acquired in a swap for next year's #2, with Nelson Akwari thrown in. Apparently, Bradley was very down on Akwari and the once-promising defender couldn't fetch much on the MLS market. With the pick, the Metros took defender Tim Regan from Bradley University, another player familiar to Bob from his Fire days. The Metros rounded out the picks by drafting South Carolina defender Tim Glowienka at #30, two Virginia players, Kenny Arena (Bruce's son) at #32, and Jacob LeBlanc at #42, and Puerto Rican Barry University product Marco Velez at #49, acquired from New England for next year's 6th rounder. Velez played for the Metros against the Atlanta Silverbacks in a friendly last year.